The Captain PD270 Kit by IJOY is a dual box mod which is powered by two 20700 batteries and features the Captain S sub ohm tank. The kit is an all in one presentation, giving you everything you need to start vaping sans the e-liquid. The PD270 box mod features the IWEPAL temperature controlled chipset and lets you fire up to a maximum of 234watts. I would like to thank Heaven Gifts for sending the 234W IJOY Captain PD270 with Captain S TC Kit our way for the purposes of this review, which I hope you enjoy and find helpful! The packaging on the IJOYCaptain PD270 kit is certainly top notch. It features a product picture on the front of the box with all of the specifications and contents outlined on the back. A plain two-part box slides out from the outer packaging, which houses the goods. The mod and tank are kept safe with enough padding to ensure nothing gets damaged whilst in transit. Below these are the rest of the accessories that go with the Captain PD270 kit. Being a little slow to jump on the 20700 bandwagons, this was my first 20700 mod and to be honest I didn't quite know what to expect in terms of size and weight. Upon sighting the PD270 for the first time I was impressed with the size of it, considering it was rated at 6000 mAh. There certainly are dual 18650 mods that are bigger than this, so I was initially impressed with the size and weight on this mod. The mod looks and feels very well made and it seems they have squeezed a lot of performance into a fairly small box mod considering all the features advertised by IJOY. The Captain PD270 kits are available in six different colors and I received the black one. The finish is really nice and has carbon fiber accents around each side of the mod which looks really smart. There are skins available separately as sticker packs that you can replace over each side if you want to customize your Captain mod further. The face of this IJOY mod features a large screen, the +/- buttons and a micro USB port. On the rear of the mod, there is a large colorful inlay that has the Captain logo on it. It seems you might be able to take this out and customize it with a picture of your choice, however, I didn’t fiddle with it too much. One side of the Captain PD270 mod houses the oversized signature IJOY fire button, along the lines of the RDTA box mods. The bottom of the Captain PD270 features a hinged battery door that slides over to one side to remove and replace batteries when needed. It seems nice and solid with no rattles at all evident. On the top of this mod from IJOY, there is an elegant stainless steel, spring-loaded 510 connection which offset to the right-hand side of the mod. All in all, I'm really happy with the look and feel of the Captain PD270. It feels great in the hand, not too big, not too small. It contours nicely on each side contributing to a nice ergonomic feel. The build quality is second to none and seems very robust and solid. The 25mm Captain S sub-ohm tank looks just as well made and elegant. It features a wide adjustable cyclops style airflow on the bottom which is continuous in its turning circle. There is some knurling on the bottom of the tank to aid in screwing on and off the bottom section. There is a nice groove cut out just below the glass section, which is advertised to help in keeping the temperature of the tank down. The top cap slides over to one side to reveal a fill port and there is a nice angled drip tip pre-installed. The Captain tank comes with a 510 drip tip adapter as well, so you can run your favorite drip tip of choice, which is a definite pro. Everything seems to hold together really nicely and the tolerances of the o rings are spot on. I didn't find any smell of machine oil on the Captain S sub-ohm tank, so quality control speaks for itself on that one. Once apart, we find that the coil heads simply slot into place with the use of correctly sized o rings. There is no need to screw anything down and I find this to be a super simple way of replacing your coils when needed. It appears that the coils heads can be replaced with juice still in the reservoir as long as you are holding the tank upside down when doing so, another huge pro in my book! All in all, I am also very impressed with the look and feel of the Captain S sub-ohm tank. Build quality is fantastic and it is also very visually appealing too. There has been some thought process put into the design and manufacture of this tank and I am keen to give it a vape and see how she performs. Installing the batteries on the Captain PD270 is very straightforward. 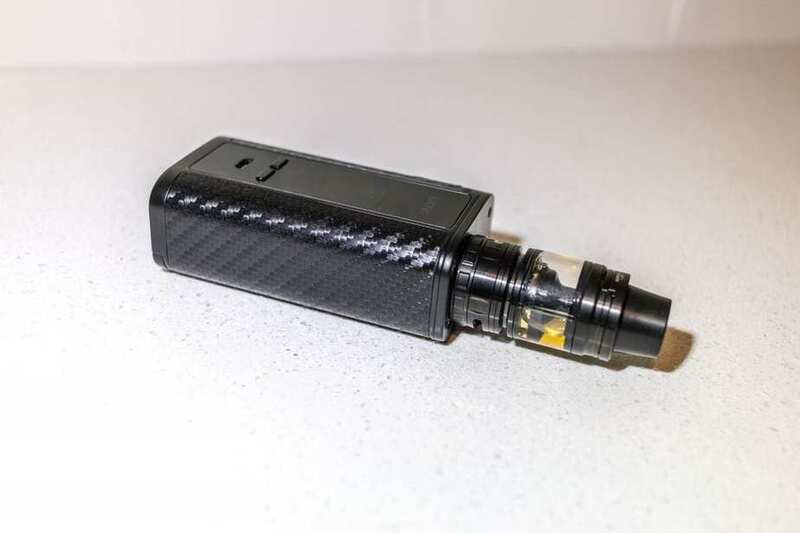 Simply push the battery tray to the side indicated with the arrow on the bottom of the mod and the hinged battery door will open exposing the battery tray. Just install the batteries according to the orientation that is labeled on the inside of the battery door and close your PD270 up. There is an adapter also included that lets you use two 18650 batteries in the tray, which is handy to have included. 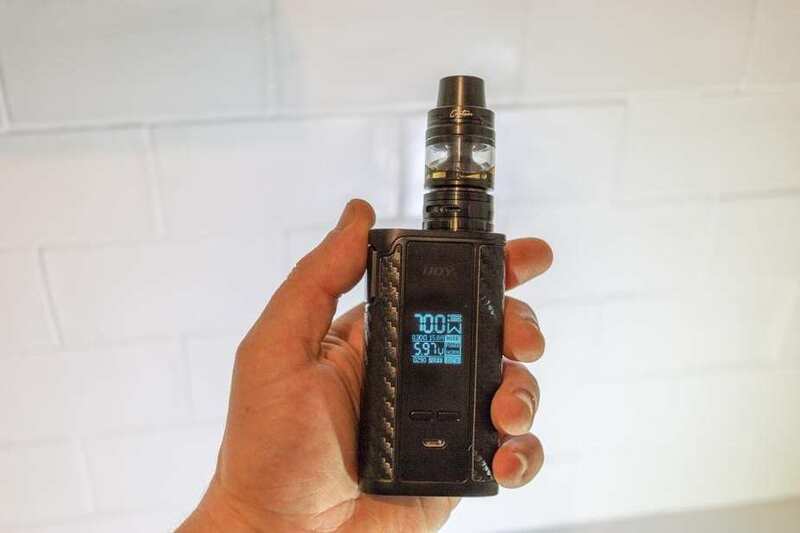 You can charge your batteries from within the Captain mod using the micro USB port, however, this does take quite some time and you are unable to pass through vape on the device while it is on charge. We recommend using an external battery charger which is quicker and usually safer than using your mod, such as Captain PD270, to charge your batteries. When using high amp batteries it is always recommended to follow safety precautions. You can brush up on our article on battery safety here. The Captain PD270 does feature upgradeable firmware via the micro USB port, so ensure to check regularly for new updates that can be pushed to your device. Once you have installed your coil head, as we mentioned earlier, it's time to fill up the tank. On the top cap, there is a small label that says 'push' with an arrow indicating which direction you need to push it. Once you do that, the fill port is exposed for you to add your e-liquid. The Captain S sub-ohm tank takes around 4ml of e-liquid and you can fill it via a bottle or dropper without any hassle. When you push the cap on the fill port back in place, be ready for some e-juice to run out and down the tank if you haven't been careful in filling it up. Remember to prime your coils and let the tank sit for a while to ensure that the coil is fully soaked before using it for the first time. Airflow can be adjusted to taste by turning the airflow ring at the base of the tank. The airflow ring turns without much resistance, so it is easy to dial in your preference even when the tank is fitted to your Captain S mod. Screwing the tank onto the mod is very straightforward and there is little resistance when fitting it. There is no visible gap present, so the tank and mod package look like they were meant to be from the start. If you aren’t using the Captain S sub ohm tank on the Captain PD270 mod, you can use whichever atty you like to a maximum of 30mm before you get any overhang. The menu system is very easy and intuitive to operate and functions just like the other IJOY mods on the market. Five clicks will turn the mod on and off and three clicks will enter the navigation menu. The navigation is the same as the previous Captain versions we have reviewed already so nothing new here. The mod supports both Wattage mode and TC mode with support for SS, Ni, and Ti. You also have the option of entering 2 sets of custom TCR values to hone down on your favorite setup. There are a slew of safety mechanisms built into this Captain PD270 mod which are all covered in the manual. You can set the screen timeout value and reset the puff counter if you wish. You can also change the power level from normal, soft or hard and have the ability to develop your own ramp level for each puff. In order to do that, just enter the value for each half a second up against a total of three seconds. Scrolling through the wattage and temperature range is done at speed if you hold down the selection button. Or it will step in increments if you press it without holding. I have to say that overall the IJOY Captain PD270 with Captain S TC Kit is very satisfying to use and certainly provides an impeccable vaping experience. It's a joy to use because it is so simple and just simply puts out. There is no delay in firing the coil after pressing the fire button, it's quite instantaneous really. The Captain Pd270 buttons are quick and responsive and there are no rattles at all throughout the mod. The flavor and vapor production are top notch once the coils are broken in. I would say that they take about one full tank before the true flavor starts to come out and during this time it is best to build up the wattage gradually until the coils are bedded in any way. Wattage mode in Captain mod works really well and delivers a smooth, consistent vaping experience. The ramping modes work well and can help you find that sweet spot just right for you. I found the sweet spot for me was the normal setting at around 70 watts for the coils that come with the Captain S sub ohm tank. Here I was getting full on flavor and decent vapor production with the airflow set to wide open - a nice airy draw for direct to lung hits. Although, if you back off the airflow it will cater towards restricted lung hitters no problems. I found that if I took the wattage up any higher, I was sacrificing flavor for more vapor production, so I was happy here. I did not get any dry hits or spit back from the tank and the overall experience was very satisfying. The coils ran with high VG juice without a hitch. Given that the Captain PD270 kit only came with pre-built coils, I was unable to try the Captain S sub ohm tank in TC mode. There is an RBA coil available separately which will enable you to build your own coils and make use of your favorite TC wire. I would have liked to have seen this kit come with the RBA and also a spare glass for the tank in case of breakage. I did, however, try the Captain PD270 mod in TC mode with some of my other attys and I found it to be spot on. It works as advertised and I am happy that they have nailed TC mode on the IWEPAL chip. I did not experience any misbehavior at all from the mod including ohm jumping or erratic behavior. I found the included drip tip to be very comfortable and I did not have to resort to using the 510 adaptor. There can be a little condensation build up on the inside of the tip, however, most good sub ohm tanks will suffer that trait these days. Using a sub ohm tank, be prepared to go through juice fairly quickly. Again this is also an offshoot of the current sub-ohm tank trend, so no surprises here. Again, Captain PD270 from IJOY comes with a large screen which is bright and displays all of the information you could need at a glance. I had no issues checking the screen in both high and low light situations, it held up very well. There are dual battery meters, which is also handy in checking where you are at with remaining power supply. The battery life of the dual 20700 batteries that come with Captain Kit is great. I noticed a huge improvement in battery life in comparison to dual 18650 mods and I definitely had to put them on charge less. Again, battery life is very subjective and something that will vary on the user and their preferred style of vaping. The PD270 mod is very well sized and can fit into your pocket no worries. It gets the tick from me for portability and is very easy to take with you when you are on the go. IJOY has done well here to include so much in such a small package, so well done here! All in all, I am super impressed with the IJOY Captain PD270 with Captain S TC Kit. It has great aesthetics and ergonomics. It performs very well providing great flavor and great vapor production. 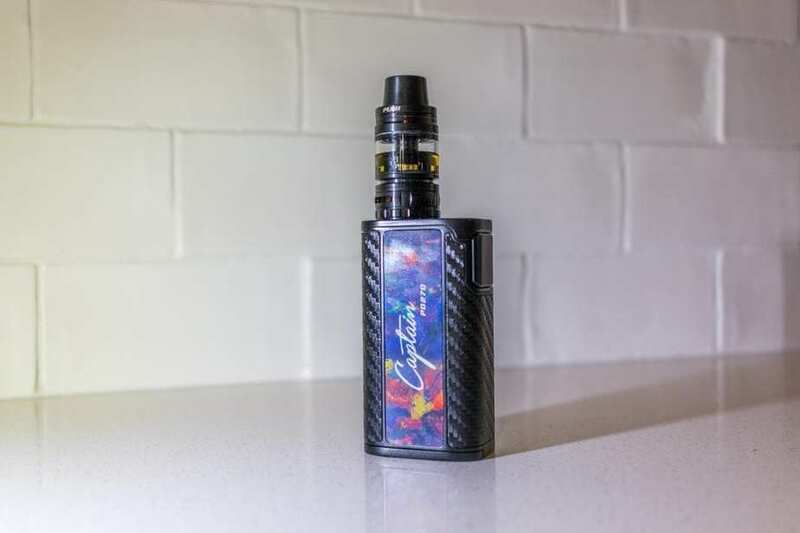 The battery life offered by Captain PD270 is great with conservative vaping and has the potential to power some very heavy hitting attys with a maximum of 234 watts. Also, theI IJOY mod is also friendly in terms of being able to fit in your pocket and portability. I am very satisfied with the vape that the IJOY Captain PD270 with Captain S TC Kit gives and I would be very happy to recommend it to anyone who is interested in giving it a go. There is some serious value for money in this kit and I promise you will not be disappointed if you choose to give it a whirl. I hope this Captain PD270 review has helped you in your quest to find your next vape kit. Please let us know in the comments below if you have any questions or comments.